To change your password, just navigate to the login page and click "Forgot password" at the bottom of the screen. You'll be directed to a screen where you'll be prompted to input your email address. 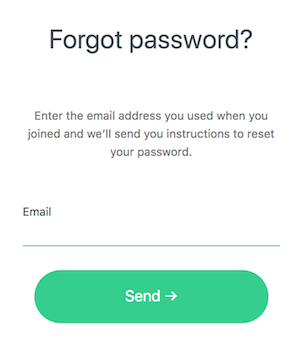 After entering your email address, click "Send" and sit tight while you wait for your password reset email to arrive. Just look for the email from WorkChain.io with the subject line "Password recovery." If you can't find the email, please wait 20 minutes for it to arrive. Be sure to check your Spam folder or Promotions tab if you use Gmail to make sure it didn't end up there. If you didn't receive the email, please feel free to contact us.